Indonesia and Malaysia – Sometimes the wrong train will get you to the right place. In about as much time as it took us to get from Melbourne to Perth, we got from Perth to Bali and touched down in a totally different world. Gone were the familiar luxuries of western cities, and in their place a sweltering chaos; a requirement for self-awareness. After confirming over and over again with a prospective taxi driver that he has a meter and that he drives for the Blue Bird Group (a particularly reputable taxi organization in Indonesia), we got to his car, which was neither Blue Bird nor metered. He assured us that our trip would cost the same as it would with a meter, a mere 150,000 rupiah ($11). This was tantamount to armed robbery, but we managed to talk him down to a more-reasonable-yet-still-far-too-much 80,000 (about $6). Past Hindu temples and food carts we flew, through the congested streets of Bali with reckless abandon, harking back to our days in India. We eventually came to a busy corner, where our guest house was meant to be. The staff had no knowledge of our booking, and the last room available had a broken air conditioner, so they offered to put us up in their sister hotel, some several hundred meters away, for the same price. We were finally checked in and collapsed from exhaustion at a far later hour than we were used to for the several months prior. 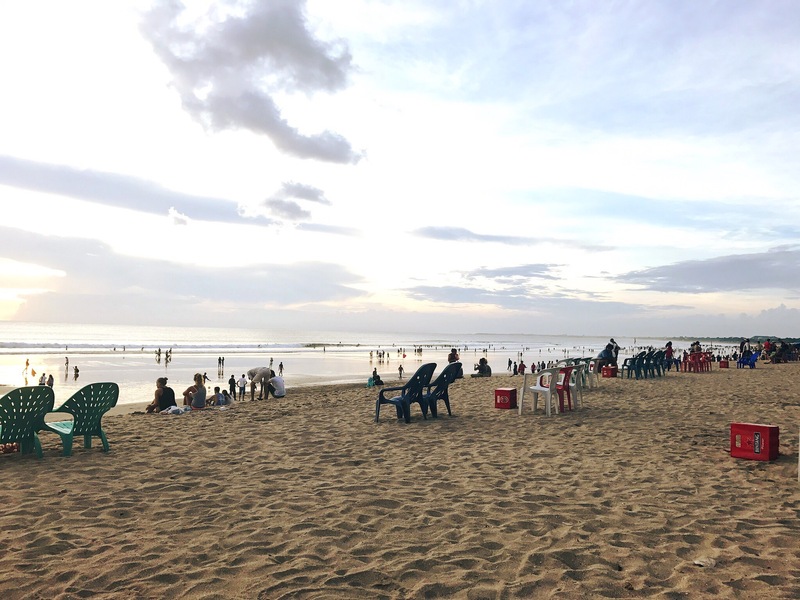 The beach in Kuta, Bali. Nevertheless, at 7am the following morning we were wide awake, regardless of having gone to bed only six hours earlier. 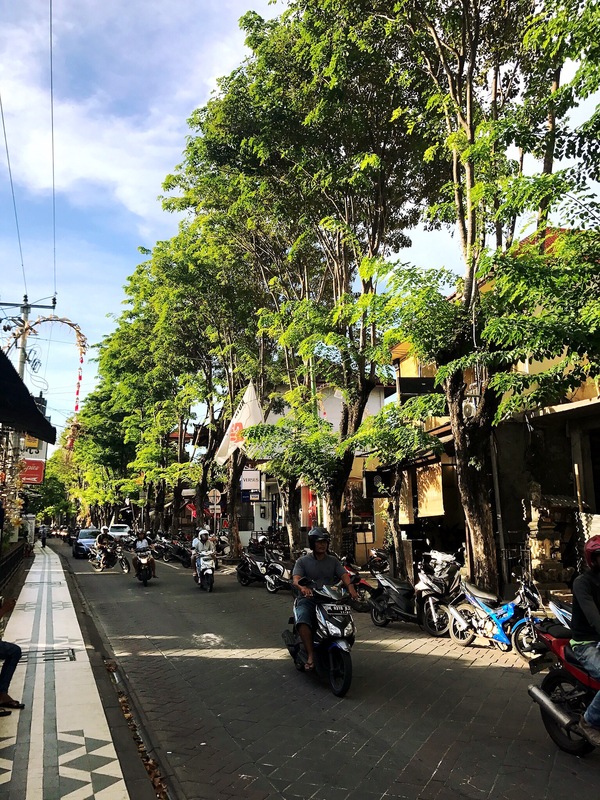 We spent most of our one full day on Bali wandering around Kuta, picking up a few requirements, like flip flops and shorts, for our more extended stay in the balmy climes of Southeast Asia. We spent the evening on the kilometers-long beach, sipping cold beers costing a veritable pittance compared to those of Australia and the Pacific. Oona even splurged on a massage (while seated on the beach with beers in hand, mind you), because why not? We were pretty enamored with the overwhelming affordability of nearly everything, and our haggling skills, forged in the marketplaces of Central Asia, were being thoroughly dusted off after months of disuse. The locals were surprisingly accepting of sums much smaller than their initial asking price as well. We booked the quick transport to Gili Air (weirdly, “air” means water in Indonesian) for the following day, and the price list at the first boat stand we saw indicated a fare of 500,000 rupiah (almost $40) per person. We offered 350,000, knowing that we could find tickets for that much from elsewhere, and they were basically like “OK, sounds good”, which made us wish we had offered something even lower. The price even included pickup from our hotel, so they showed up at around 7am the following morning and took us to the dock in Padangbai, some 40km away. The one hour boat ride to the Gilis was fairly uneventful. 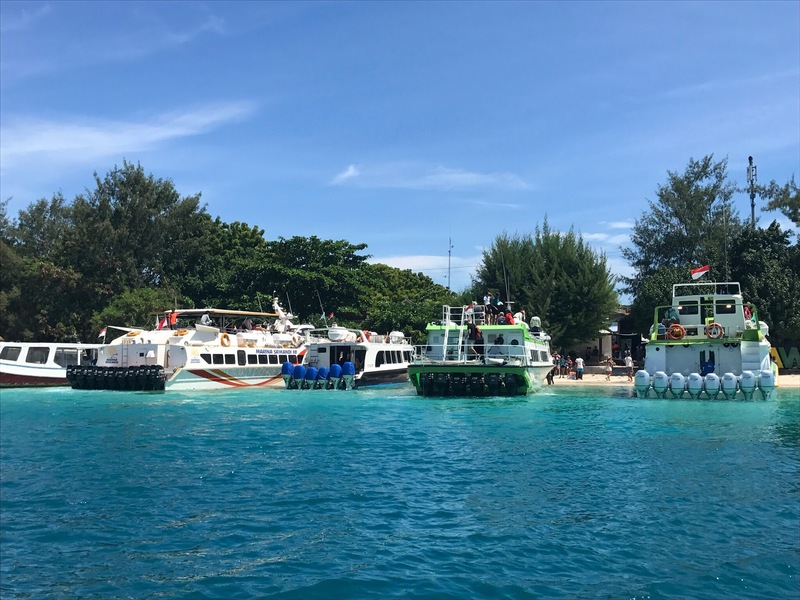 We were two of five other passengers that disembarked at Gili Air, with nearly the entire boat load of 60 or so getting off at the much more heavily-touristed Gili Trawangan. Gili Air was shockingly touristy for a place billed to be “less touristy than Gili Trawangan”, but we suppose that we’re back in the touristy part of the world, or at least that catering to backpackers like us. 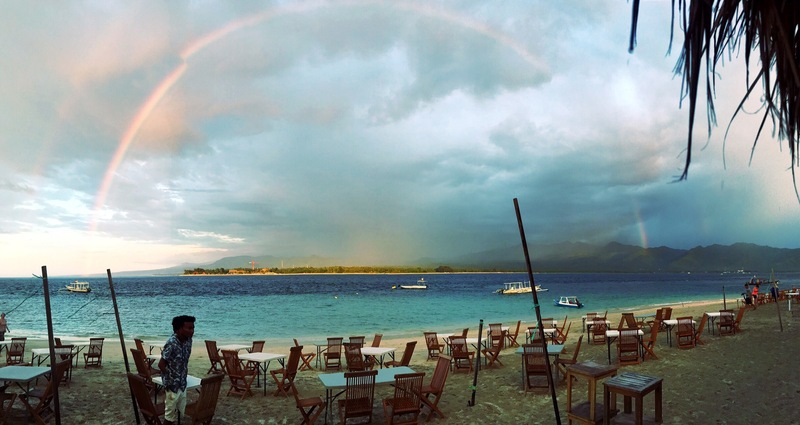 Gili Air was quaint and small, but the effects of the tourist influx were clearly seen, whether from the western-looking cafes offering gluten free this and organic that or the numerous bars guaranteeing the best magic mushrooms on the island. SUP yoga and organic smoothie shops were everywhere in sight. The boats are powered by teams of outboard motors. Nevertheless, it was a nice place to spend a few days, especially in the off season. It was explained to us that during June, July, and August, the island gets much more crowded. This was evident in that most of the bars and restaurants were able to accommodate far more people than they were currently serving, and most of them sat empty while a server or two invited any and every passerby to come have a drink or something to eat, probably mostly to cure their boredom. One such place coaxed us in, although it was probably the sign advertising beer pong that did it for us. The place was totally empty, and the bartender looked to be completely off his gourd on psilocybin as he handed the beer to us. He offered mushrooms to the victor of the round (which ended up being Oona, for what it’s worth), but we politely declined. On our second day in town we booked a couple dives from a shop on the north side of the island. The dives were nice, but nothing very spectacular, they certainly did beat swimming in the forest of seaweed right off shore though. Diving in Southeast Asia is a lot more affordable than the Pacific, so we figured we might as well. Traditional and otherwise on Gili Air. With nothing better to do, we went back to the place from the night before and played more beer pong. The place was empty, again, and the staff looked on somewhat amusedly as we battled. The bartender was much more subdued tonight; surely a hangover from the day before. We left early the following morning, as we had a long journey ahead of us. We needed to get to the airport on the neighboring island of Lombok for a flight at 2:55pm. Our first leg was the public ferry to Bangsal, the nearest port on Lombok. The public ferry leaves whenever it gets 40 passengers, which only took 30 minutes or so of waiting. The crossing was very short, and took only 20 or 30 minutes. Touts surrounded us at Bangsal, asking where we were going and offering to drive us for ridiculous sums of money. We knew that the price for a taxi to the airport is around 350,000 IDR, and some of the drivers were offering around that much. Another tout offered a shuttle bus for a “cheaper” price, which ended up being 250,000 per person (maybe he thought that we didn’t grasp simple math). We talked him down to 100,000 per person, which seemed to be a decent price for shared transport. While we were waiting, a competing driver offered the same price, so we hopped in his car for the 1.5 hour trip, which we concluded was a good deal for a private taxi ride. It happened to be our two year anniversary that day, so Ian had surreptitiously planned something special. We arrived at Bima after a short and uneventful flight on a small prop plane, and were greeted by a driver at the airport. After nearly two hours of winding our way through village and jungle, we finally arrived at the very new Kalimaya Dive Resort, just west of Komodo National Park. The property was beautiful, secluded in a bay between two tiny villages, and the staff was very welcoming. We still hadn’t properly celebrated our engagement, and what better time than on our two year anniversary? So a bottle of champagne was waiting for us in our room, which we popped open as soon as we settled down. Our stay at the resort was fantastic, overall. The staff was great, and the diving was pretty excellent too. Unfortunately, Ian’s lack of certification meant that he could not participate in most dives, however, he was encouraged to snorkel at the same areas. Of course, he missed out on some of the more stunning underwater spectacles, but the snorkeling was pretty awesome too, and it was kind of a trip to see the divers deep below from a bird’s eye view. At any rate, getting certified is now a priority. One dive was particularly memorable, as the crew (Ian included, from the surface, however) were witness to seven manta rays cruising this way and that. Being in the presence of such huge animals, moving so majestically and silently through the water, was very humbling. As it turns out, we saw manta rays on several of the other dives, and spotting them is not extraordinarily rare in these parts. After a lovely time doing a lot of diving and a fair bit of relaxing by the pool with beer in hand, we set off for the island of Flores, some 50km to the east of Kalimaya. A daily ferry leaves from Sape to Labuan Bajo (the main settlement on Flores) at 5pm, so we said goodbye to our new friends at the resort and were shuttled down to Sape to catch the boat. The crossing takes about six hours, so we stocked up on bottled water and wax paper satchels of nasi ayam, or spiced chicken with rice and noodles. We walked straight through the cramped and dirty amidships, stepping over locals who were sprawled out on the floor, flicking cigarette butts into the corners, and headed for the open top deck. We secured a covered spot right next to the bridge, much to the envy of the other deck dwellers once the rain started falling. Fortunately the rain was short-lived and the rest of the journey was mostly dry. We spread out our sleeping pads and got some rest for the last few hours of our trip. Our deck spot on the KMP Cakalang. 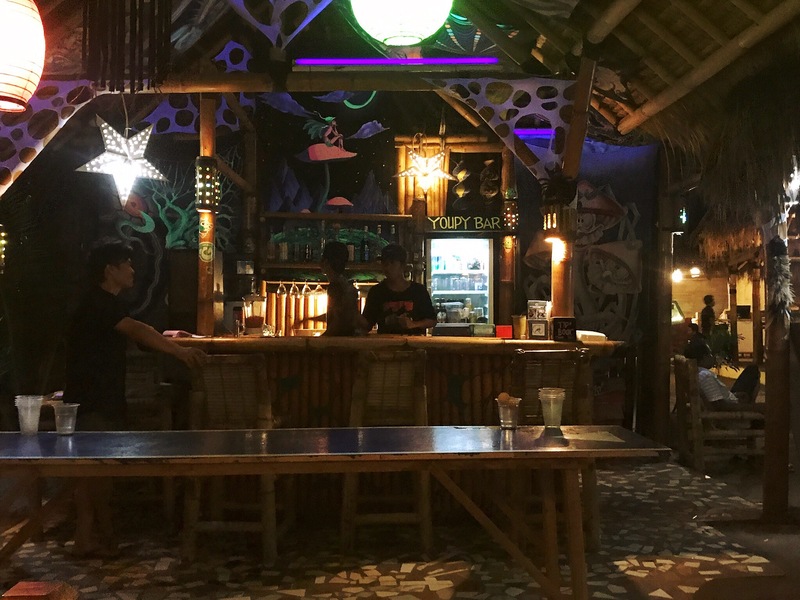 We arrived in Labuan Bajo at half past midnight and headed to the hostel at which we had made a reservation. A half dozen or so other travelers from our ferry had the same idea, and we all arrived at once. The hostel was dark and the door locked, but after a period of knocking and tense negotiations with another guest (apparently she thought we were criminals or something) the owner showed up. He showed us to our beds in a sleepy daze, and we called it a night. The following day, with far too little sleep under our belts, we headed out to do the one thing that most people do in Labuan Bajo, which is to visit the nearby Komodo dragons. This region of Indonesia is the homeland of the Komodo dragon, and most of them reside in the neighboring Komodo National Park. Boat tours to the park are securable all up and down the main street in Labuan Bajo. We nearly completed a deal with one tour operator, but backed out at the last minute because of their shady attitude. Fee after hidden charge stacked up, so we collected our money off the table and left, despite their pleas and concessions on our way out the door. We found another operator several doors down, and liked their attitude much better. The tour, as most do, included a trip to the park, a trek of your choice through the park with a guide, lunch, and a few snorkeling stops on the way back. We talked them down from 400,000 IDR per person to 350,000, which is pretty standard for the trips. One thing worth noting, however, is that this is not inclusive of the national park fee, which is a steep 250,000 IDR per person. The bay in Labuan Bajo. We headed out into the sea on a decrepit wooden boat equipped with two thundering, unmuffled tractor engines, which seems to be the way to power boats around here. While deafening, it seems to get the job done. Our first stop was the island of Rinca, where we made a several kilometer trek with our boat companions and a local guide. The soft-spoken guide gave us all sorts of information on Komodo dragons, and carried a large pronged stick, presumably to ward off attacking lizards. There were a handful of Komodo dragons lazing around the park offices up front, which we’re told they do often because that’s where the kitchen is. We also learned that Komodo dragons are extraordinarily lazy, preserving their energy wherever they can. Most of them lounged around in the sun, nary an open eye or flicking tongue. One of them posed for us to take some pictures. During our trek, the guide’s ears perked up. He crouched briefly, and had us stay put on the trail while he went to investigate. He called us over to a watering hole a moment later, where a water buffalo was cooling off. Content with such a sight, we were preparing to leave when we spotted a juvenile Komodo dragon stalking down the hill behind the water buffalo. The guide’s excitement was apparent as he narrated the scene in a hushed tone. He told us that Komodo dragons of that age have few inhibitions when it comes to the size of their prey, and are known to attack water buffalos despite their fivefold size disadvantage. The dragon quietly approached, but the buffalo was well aware of its surroundings and turned to confront it at the last second. The buffalo huffed and lunged its head at the dragon, showing that it too was not afraid, and the dragon backed off, slinking around the corner for another try later. The guide, after taking a video himself on his phone, explained that the Planet Earth crew, when filming for the documentary here, waited six months of all day filming at the same watering hole to experience such an encounter. We were very lucky to stumble upon it. We stopped off at two snorkeling spots on the way back to Labuan Bajo, the second of which was much nicer. We climbed to the top of the small island which afforded some great views of the surrounding scenery, and descended overheating and sweating to the snorkeling below. When doing some free diving around a reef, Oona spotted an immaculate cowry of around 10cm. There was still a living mollusk inside, so we let it be after admiring the beautiful shell for a bit. A typical boat plying the waters near Labuan Bajo. A snorkel spot on the way back. At this point we were in a bit of a bind. We had firm plans to be in Thailand by May 14th, to meet up with Oona’s friend from Finland as well as to celebrate her 29th birthday on the same day. Our original plans of visiting Sulawesi and Borneo were looking like they needed to be canceled in the interest of time. After fruitless searches for transport to either place, all options proved unfeasible, so a more drastic change of plans was in order. We booked tickets to Kuala Lumpur in Malaysia, via a 14 hour night time layover in Jakarta. This not only proved to be the most economical choice, but it also greatly shortened our upcoming journey to Thailand, which was a win-win as far as we were concerned. We were sadly forgoing the promising frontiers of both Sulawesi and Borneo, but the lack of development in both places demands much more time than we had, so we’re shelving that plan for now. So there we were, landing in Indonesia’s sprawling capital after having spent all of our time in the Lesser Sunda islands. We got a bit of rest at an airport hotel before flying to Malaysia early the following morning, so very little of Jakarta was actually seen. For that matter, very little of Malaysia will be seen too, with only a week to spare. A thorough exploration of Malaysia wasn’t really our intent though, as Oona had already done that, rather exhaustively, several years prior. Instead, it provided for a convenient place to spend a week in preparation for our heading to Thailand. We had only two days in KL, but we explored what we could, and visited some of Oona’s favorite spots from last time. Our hostel was in Bukit Bintang, so we spent most of our time around there the first day. After the sun went down, we ventured to the KL Tower to get a view of the city from above. The city’s main attraction, the Petronas Towers (the tallest twin towers in the world), are much more expensive to visit, and they’re obviously not really visible from themselves, so we thought it wiser to visit the tower instead. It was a relaxed experience, with not too many people, and the views were indeed amazing, if not vertigo-inducing at times. We spent the next day mostly wandering around Chinatown. We visited Petaling shopping street and Ian bought a much-needed pair of knockoff Ray Bans (er… the fact that they were knockoffs wasn’t much-needed, but just sun glasses in general). We also spent some time wandering around Central Market, where we were shocked by the number of Kashmiri vendors. Oona bought a nice cashmere scarf from one such vendor. The old KL train station. We got dinner at Valentine Roti, a little outside the center, the specialty of which is roti canai, the Malaysian take on the eponymous Indian flatbread. The population of KL is about 10% Tamil, so Indians are found pretty much everywhere around the city, and their food has made a big impact on traditional Malay food as well. The food was great, and it only put us back around $10 for everything. We went for a drink when we got back to the center, and ended up at a whisk(e)y bar with a really impressive selection (over 600 different bottles). Ian went for the Longrow 14 year, a slightly peaty Campbeltown variety, while Oona opted for the Glenmorangie Nectar D’or, a subtle and smooth Highland. We paired them with a pint of cold Tiger, which was a nice accompaniment. As we were leaving the next day –sticking to the Tashkent protocol— Ian became violently ill some time in the middle of the night. A good night’s sleep was snatched away by his frequent comings and goings, and Ian and Oona awoke feeling like emaciated husks of their former selves. With a very long day ahead, they managed to get themselves to the bus station and onto the bus ride to Mersing that was to last five hours (with no toilet, to boot). Once we arrived, we walked a kilometer through rainy Mersing to get to the jetty for our ferry to Tioman Island, where we were pointed to a handful of different desks, each handling this and that aspect of our ticketing. We had booked tickets in advance, so it was simply a matter of collecting our tickets, so we thought. One desk needed to see our proof of online purchase, while another checked our passports. The men manning the gate to the boarding area pointed us back to another desk where we apparently had to pay some sort of tax, which ended up being 20RM (~$5) per person. We were then pointed to yet another desk where we had to pay an additional 30RM per person for some sort of marine park pass (as the island itself is contained within some sort of governmental jurisdiction related to marine parks). Once into the boarding area, we asked a few other tourists if they had to pay the same fees, and they looked confused and said they only needed their tickets. So, apparently we were somehow ripped off, but we were given official-looking receipts/coupons in return for our payments, which were verified at the gate, so we’re not sure how that’s typically handled, and why we were seemingly the only ones who needed to do it. We think that simply refusing to pay may be a better option, and they’d probably grudgingly let you through anyway. The boat ride was about two hours, and we finally got to the island at 9pm. There was a car from our guest house waiting for us, which drove us across the island to the sleepy berg of Juara. We checked in, got a small dinner from the restaurant nearby which was just about to close, and promptly went to bed. 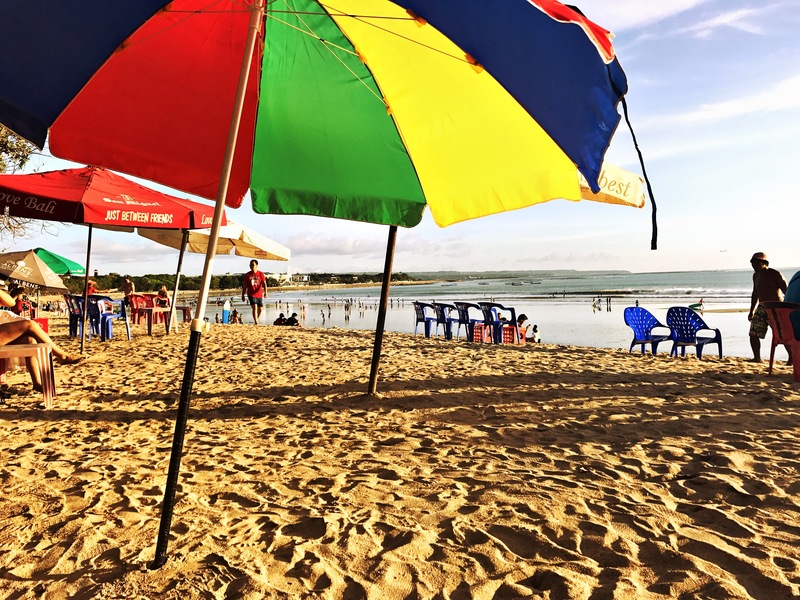 The following day was mostly used for recovery from the grueling journey, so we spent much time hanging around Juara, dabbling at a few of the local cafes, and walking up and down the beach. We also saw a decent sized monitor in the front yard of our guest house, it was interesting to see such a large lizard in such an otherwise normal setting. A streetside cafe on Tioman Island. The next day we were feeling energetic enough to do a more proper exploration of the island. We rented a scooter in Juara and drove back over to the west side of the island via the insanely steep (and only) cross-island road, which is little more than a narrow concrete slab cutting its way through the dense jungle. The grades are up to 45% in some spots, and this was much more noticeable on a scooter than the Toyota Hilux which shuttled us across two days prior, although it was definitely steep even in the truck. We spent most of the day hanging out on the west side of the island, and walked up and down the beach in the village of Air Batang, which seems to be the touristy area of the island (although it’s all pretty laid back this time of year). Some houses on the beach. On our last full day on the island we went for a boat trip up to Coral Island, just north of Tioman. Many different operators organize trips like this, but many of them require at least four people, so we went around asking different shops if anybody was leaving the following day, and we found one down the beach a little ways from where we were staying. We met them on the jetty the following morning and headed off with six others. Our particular trip stopped at three snorkeling destinations (only two of which were very interesting), a nice beach (which got quite boring after 30 minutes or so), and the village of Salang, only reachable by boat, for lunch. The snorkeling was quite fun, as there were lots of corals and some interesting fish to be seen. Seeing Salang was cool as well, although it’s mostly oriented around a couple of resorts there, so it’s another decent-sized tourist draw. Our trip onward to Thailand was most unpleasant. It started with a car ride up and over the aforementioned extremely steep cross-island road, continued with a ferry back to Mersing, and on with a much-slower-than-usual bus back to KL (the ride took seven hours, instead of the typical five, largely due to the driver cruising along at just fast enough to not be completely absurd for the surrounding highway, even though cars were blowing by us like we were stopped). We had a very short night in KL, with a lot less sleep than we anticipated (because of the much longer than expected bus ride), and continued on to the airport in the morning with a short flight to Surat Thani in southern Thailand, and finally on to Koh Samui. All in all, we took a car, a boat, a bus, a train, another train, a plane, a bus, a boat, followed by one more car to get from Tioman to Koh Samui in about a 36 hour period. Far too exhausting. Awesome and unbelievable! That buffalo / dragon encounter video is amazing!! I bet Ian’s creep face helps a lot with the haggling — it looks effective. I’m sure it only lasted 1/100 second at the champagne celebration though. What a nice gift! From an engineering standpoint, I beg to differ with that “steep hill” street sign: that wedge symbol couldn’t be more than 15 degrees. But to quibble about that is to miss the overall awesomeness of your adventure. Yeah, I think they use the same graphic regardless of that actual grade. On another note, the world’s steepest street is apparently 35%, but this one was 45%, so maybe it’s not an official street?